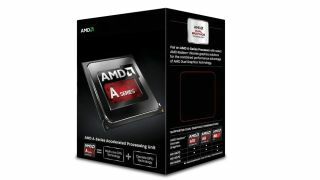 AMD has announced its new dual and quad-core desktop processors, formerly codenamed Richland. Once again known as the A4, A6, A8 and A10 from retailers and in systems, there are various versions available up to 4.4GHz with 4MB of cache and up to 779 GFLOPS of compute power in the top-end quad-core A10. Once again these are known as APUs (Accelerated Processing Units) and are hybrid GPU and CPU chips that boast Radeon HD 8000 series graphics on board. AMD says the new chips boast a 21 per cent graphics performance hike compared to last year's Trinity APU (914 vs 1,104 in 3D Mark Fire Strike). In terms of general PC performance, AMD's figures for PC Mark 7 suggest an eight per cent performance increase compared to Trinity. AMD says that its 1.3 billion transistor die gives over 42 per cent of the space to graphics cores compared with an estimated 31 per cent on Intel's new Haswell Core chips. It believes balanced, hybrid GPU-CPUs are clearly where the market is heading and Intel seems to agree. The news follows on from last month's launch of the Richland mobile processors as well as two other types, Kabini for mainstream laptops and Temash for lower powered devices such as tablets and hybrids. Check out our A4-5000 review here. AMD isn't giving up on the desktop segment yet though. "PCs are still shipping over 300 million units a year. It's a good business, but it's facing some challenges," said Dr. Lisa Su, head of Global Business Units for AMD at the launch attended by TechRadar. "The desktop channel is an important part of the market for AMD." But it's clear that, like Intel, AMD sees a bigger future for portables than desktops as that's where the innovation clearly is. Don't believe us? Check out what we thought of Intel's top-end Haswell CPU, the Intel Core i7-4770K.